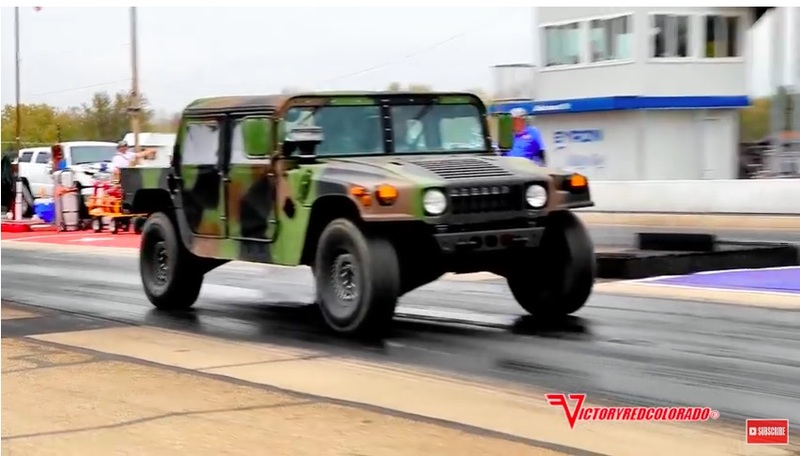 Hustlin’ HUMVEE Video: This Military HUMVEE Has A Hot Rod Duramax Swap And Runs 12s! Ok…ok…Ooooook. This is awesome. There’s always something great of taking a slow vehicle and making it fast, right? The more slow the starting vehicle and the faster the end product the better. The scale is kind of sliding. Oh, you LS swapped a 1980s Volvo, that’s fun. You stuck a turbo on a four banger econobox and now it makes tire spinning power? Woot! We love it. Your military HUMVEE has a hot rod Duramax swap and runs 12s at over 100 mph. WE’RE DEAD. This is one of the best things we have ever caught a look at because it is so far afield from what anyone would expect. Just awesome. H1 HUMVEE rigs are amazing. They have served with distinguished honor in the military for decades now and are being phased out for a new vehicle. They have been for sale in droves at auctions over the years as they reached the end of their service lives and that pace will accelerate even more as they all get turned out of service. Powered by the venerable 6.5L diesel engine, the HUMVEE is the opposite of fast. They are not designed to be fast. They are designed to work and pull and live and protect. The 6.5L engine was a rock solid reliable choice for power and something that would run in the harsh climes where the trucks served. We knew of guys doing big block gas engine swaps and stuff but for some reason we did not even think of a warmed up Duramax in one of these things. It appears to be completely unaltered aside from the engine and transmissions and that’s the game here. It has to be so heavy! This might be our favorite sleeper ever. Press play below to see this freaky awesome 12-second Humvee! Morning Symphony: A 427 Cammer-Powered 1955 Ford Gasser Being Driven In Hate So Very Wrong, So Very Right: A 1973 Chevrolet Monte Carlo Time Warp! I think this is the same Humvee that PPEI built a few years back to show off their standalone Duramax harness. I have the issue of Diesel Power that it was featured in such a cool swap! This must be double cool because it’s the second time it’s been posted here.